College Football Playoff Semifinal Michigan State vs. Alabama: Tied for ESPN’s Fifth Best non-Championship College Football Game on Record; WatchESPN Records Set for Both Semifinals - ESPN Press Room U.S. 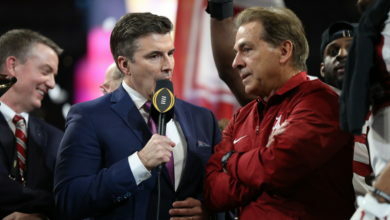 The College Football Playoff Semifinal’s first appearance on New Year’s Eve resulted in strong numbers on ESPN’s television and digital (WatchESPN) platforms. The College Football Playoff Semifinal at the Goodyear Cotton Bowl Classic, in which No. 2 Alabama defeated No. 3 Michigan State 38-0 (New Year’s Eve at 8 p.m. ET on ESPN), earned a 9.9 overnight rating, tied for ESPN’s fifth best overnight for a non-Championship college football game on record (approximately 1350 games). The College Football Semifinal at the Capital One Orange Bowl, which resulted in No. 1 Clemson advancing past No. 4 Oklahoma 37-17 (New Year ’s Eve at 4 p.m.), earned a 9.7 overnight, ranking seventh among ESPN’s non-Championship college football games on record. Rounding out the first half of the New Year’s Six, No. 18 Houston defeated No. 9 Florida State in The Chick-fil-A Peach Bowl (New Year’s Eve at noon), garnering a 4.0 overnight, up 21% from last year’s Peach Bowl. Digitally, the Cotton Bowl and Orange Bowl become the second and third most-streamed games for any sport, excluding the World Cup, in the history of WatchESPN based on average minute impressions, with the Cotton Bowl adding 318,000 average minute impressions to its TV audience and the Orange Bowl adding 300,000 average minute impressions to its TV audience. Last year’s College Football Playoff National Championship (Jan 12, 2015) is the only game to top the New Year’s Eve semifinals. Additionally, the Sooners-Tigers matchup had 1,188,000 unique viewers, the second most-ever viewers for any sporting event, excluding the World Cup, on WatchESPN. The Spartans-Crimson Tide game had 1,047,000 unique viewers, ranking fourth on that same list. The Cotton Bowl, based on average minute impressions, was up 271% from the 2014 Cotton Bowl, 281% from last year’s New Year’s Eve Prime Time game (Orange Bowl) and up 24% from last year’s second semifinal game, which was held in prime time on New Year’s Day (Sugar Bowl). Based on unique viewers, it was up 140%, 307% and 15%, respectively, in the same three categories. The Orange Bowl, based on average minute impressions, was up 259% from last year’s Orange Bowl, 299% from last year’s New Year’s Eve late afternoon game (Fiesta Bowl) and up 158% from last year’s first semifinal game, which was held late afternoon on New Year’s Day (Rose Bowl). Based on unique viewers, it was up 362%, 307% and 46%, respectively, in the same three categories. On average, this season’s College Football Playoff Semifinals, added 313,000 average minute impressions to the TV audience, had 1,117,000 unique viewers and 67,142,000 minutes watched, up 67%, 29% and 58%, respectively, from last year’s two-game semifinal average. The Peach Bowl added 137,000 average minute impressions to its TV audience, 589,000 unique viewers totaling 32,345,000 minutes viewed, up 57%, 86% and 81%, respectively, to the Peach Bowl last year, which was held in the same New Year’s Eve noon timeslot. Birmingham was the top-rated market for both the Cotton and Orange Bowls, earning a 48.1 and a 35.6, respectively. Greenville, which was the second-highest market for both semifinals, earned a 29.6 market rating for the Orange Bowl, the market’s highest-rating for an ESPN bowl game on record, and a 21.3 rating for the Cotton Bowl. Top 10 markets for Cotton Bowl: Birmingham (48.1), Greenville (21.3), Knoxville (21.2), Nashville (21.1), Atlanta (20.2), Detroit (20.0), Columbus (19.7), Jacksonville (15.9), Memphis (15.9), and New Orleans (15.7). Top 10 markets for Orange Bowl: Birmingham (35.6), Greenville (29.6), Oklahoma City (29.4) Tulsa (27.9), Knoxville (18.5), Atlanta (17.8), Columbus (17.6), Nashville (15.8), New Orleans (14.4), and Charlotte (14.2). The 2015 Cotton Bowl received the highest overnight for the bowl game on record, all networks, dating back to 2005. Additionally, the game is up 106% from last year’s New Year’s Eve prime time game (Orange Bowl) and up 87% from the 2014 Cotton Bowl. The 2015 Orange Bowl is up 111% from last season’s New Year’s Eve late afternoon game (Fiesta Bowl) and up 102% from the 2014 Orange Bowl. Also, it received the best overnight for an Orange Bowl since 2006. Both Michigan State vs. Alabama and Clemson vs. Oklahoma become the highest-rated New Year’s Eve games on ESPN, based on overnights, surpassing the previous best (2013 Chick-fil-A Bowl) by 87%, and 83%, respectively. More detailed ratings will be made available this afternoon.